1 December 2012 was my third World AIDS Day in a serodiscordant relationship, and I think it has been my busiest. As I write this, I have just got home from collecting for Positive Life at the Grand Opera House in Belfast, which was a surprisingly extrovert thing for me to be doing. If you are living with HIV there are still people who judge you. “I don’t know what you were doing when you caught it,” people say,”but it must have been something very stupid.” I’ve even encountered Christians who take that attitude, perhaps with the explicit assumption that if you are HIV positive it must be because of something dreadfully sinful that you did. What sayeth the scriptures? Do you think that these people were worse sinners than other people because they suffered this way? Christ told us no. As it was for the Galileans whose blood was mingled with their sacrifices, as it was for those who the tower in Siloam fell, so for those living with HIV. Because HIV can be sexually transmitted, there is a tendency for Christians to look down on people who are living with HIV, almost as though the HIV is a punishment for immorality. Someone who is HIV negative can then look down on someone who is HIV positive. Again, what sayeth the scriptures? 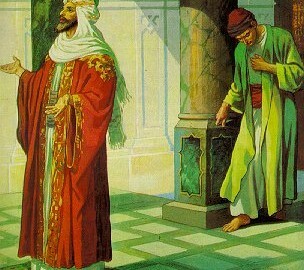 When a Christian judges someone because they are living with HIV they are behaving exactly as the Pharisee did in this parable. ‘God, I thank you that I am not like other people—like those living with HIV’. Living with HIV is not evidence of a sinful life. Just because one group of the population is more likely to be HIV positive than another group does not mean that it is morally inferior. If you think that it is, then you are behaving exactly like the Pharisee. As Christians, our attitude to those who are HIV positive should be exactly the same as our attitude to those with heart disease, diabetes, cancer, or any other long-term illness. We should treat everyone with the same Christ-like love.